Looking for ideas for Halloween activities for toddlers and preschoolers? We’ve got some fabulous fine motor, gross motor, crafts, snacks and sensory play ideas your child will love! Are you ready for Halloween Tot School? This week we’ve rounded up some of the best fine and gross motor skills activities and crafts we could find. And as usual we’ve thrown in some links to Halloween themed printables, books and yummy snacks so you have everything you need for a Halloween Tot School for your toddler or preschooler. We’ve got everything from spider play dough and a giant lacing spiderweb to a scavenger hunt and even a witches brew! 6. Halloween Playdough – A Ghoulish Invitation to Play and Create! We must not forget about helping develop the larger muscles needed for gross motor skills and encouraging climbing, running, crawling and jumping. 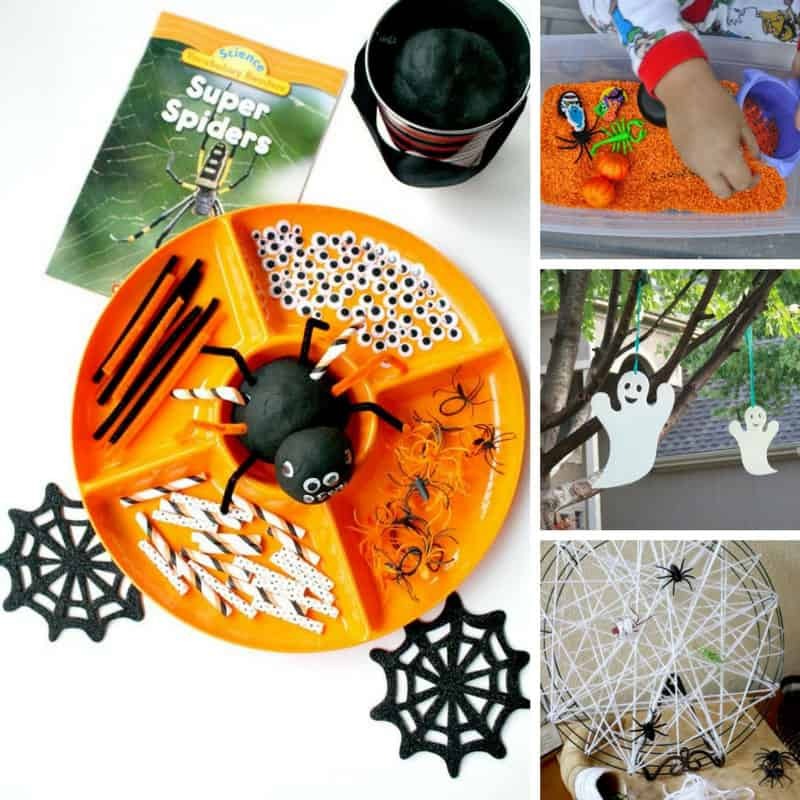 Here are some wonderful Halloween gross motor activities to get your little one up and moving. Crafts are another way to develop fine motor skills and creativity and at the end of the session your tot will have created something they can show to daddy or their grandparents. These are some of my favourite Halloween crafts for toddlers and preschoolers! ==> easy Halloween crafts for kids collection! All this learning is enough to make anyone hungry, so why not fix one of these tasty Halloween snacks to enjoy together! ==> easy Halloween cookies for kids collection!